This book shows the relationship between the changing nature of capitalism and the creation of the new man and woman. Specifically the focus is on the origins and fate of the new worker in Late Capitalism. The book combines a Gramscian critique of contemporary patterns of capitalist labour control and Lacanian psychoanalysis to account for the development of new forms of social subordination including the context for social emancipation. All the demonstrations are based on empirical analyses of diverse fields: car and aeronautical design, job centers, rail transportations, advertising, and so on. A chapter questions the work of the customers and economic or political meanings of these transformations. The book ends by offering two scenarios: one is the continuation of the current situation with the ecological, migratory, and disasters of inequality (with a return to urban violence) which are entirely predictable; the second scenario suggests an enchanted future when all these questions are resolved by social innovation and the supersession of capitalism. This book interrogates the myths that surround the changing nature of work, which is essential if we are to navigate through the many challenges – both material and ideological – that these transformations bring. Durand helps clarify the reality of what is going on, and presents careful consideration of the many tensions related to employment and consumption that are emerging. This is an important intervention that provides critical reflection on the changes occurring in spaces of work (Miguel Martinez Lucio, Professor of International HRM & Comparative Industrial Relations, University of Manchester, UK). 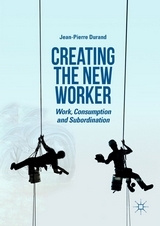 With historical vision, Jean-Pierre Durand advances a theory of the contemporary worker, searching for meaning and recognition in a precarious world where the line between consumer and producer disappears. A decisive contribution to the new labor studies (Michael Burawoy, Professor at Berkeley University, USA, and former President of the International Sociological Association).